General Motors (GM: $36/share) announced on Monday that it will idle five factories, cut its North American workforce by 15%, and cease production of six underperforming models. The auto giant will use a portion of the savings from this move – estimated at $6 billion – to further investment in electric vehicles and self-driving cars. This announcement shows why corporate governance – the “G” in ESG – is the most important, yet overlooked, element of sustainability. In particular, we are referring to the governance of shareholder capital. Without intelligent capital allocation, businesses, no matter how good their environmental and social impact, may not survive. GM’s high-quality corporate governance played a critical role in driving a capital allocation decision that not only creates value for shareholders but also makes the underlying business more sustainable. Regular readers know that GM is one of our top stock picks due in large part to its executive compensation plan that links 50% of long-term stock grants to return on invested capital (ROIC). ROIC should be a part of every executive compensation plan because it is the primary driver of shareholder value. Crucially, a business is only sustainable in the long-term if it earns an ROIC higher than its weighted average cost of capital (WACC). A company can grow revenue and reported earnings in the short-term through low-return investments and acquisitions – i.e. Valeant – but that strategy will eventually drive a company under. As Figure 1 shows, GM’s cuts to production are a response to shifts in demand and cost structures that are driving down ROIC’s in the North American car market. Simply put, the factories that GM is idling and the models it is discontinuing are no longer worth further investment. The rule of thumb in the auto industry is that a factory has to operate at 80% of production capacity to make money, and the factories GM is closing were operating at as low as 31% of capacity. Closing these factories and discontinuing those models is the better option not just for shareholders, but ultimately also employees. If GM continued to invest in underperforming operations, it might have to lay off all workers, not just the ones in underperforming operations. 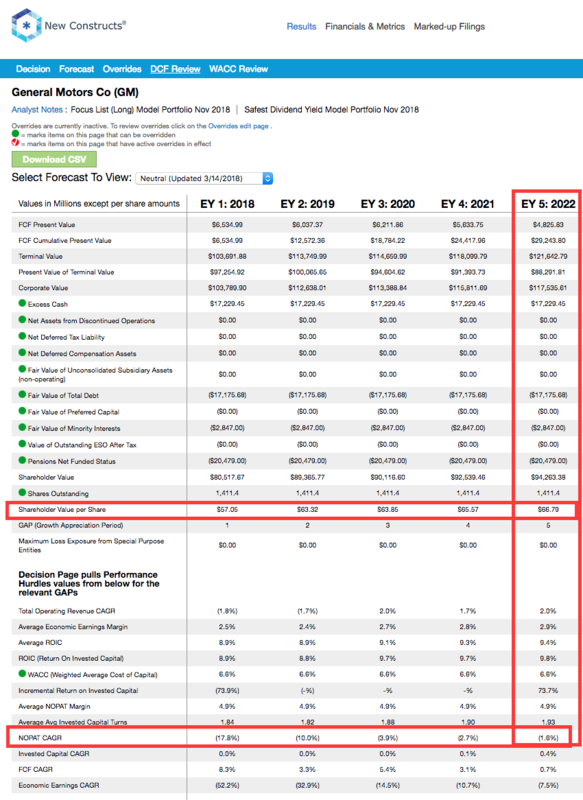 Notably, many analysts expected Ford (F) to be the first to make these sort of dramatic cuts, given its inferior profitability as shown in Figure 1. Instead, Ford appears to be delaying the needed transformation of its business. In this respect, the two companies have switched places. In 2006, Ford made dramatic changes that allowed it to survive the coming recession while GM foundered into bankruptcy. Now just over a decade later, GM has definitively surpassed Ford as the more profitable U.S. auto company. As Figure 1 shows, that shift dates back to 2014, the same year GM added ROIC to its exec comp plan. Consolidating its production so that 75% of sales volume will come from just five vehicle architectures. Fewer vehicle architectures gives the company more flexibility to shift production between different models to accommodate changes in demand. 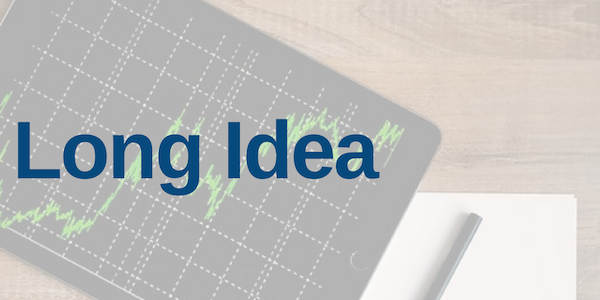 Focusing product development on more successful and profitable models. Allowing the company to double the amount of resources committed to electric vehicles and self-driving cars by 2020. This last point is the most important. Investments in EV’s and self-driving cars may not be producing profits today, but developments such as Softbank’s $2.25 billion investment in GM’s self-driving unit validate the long-term potential of these efforts. 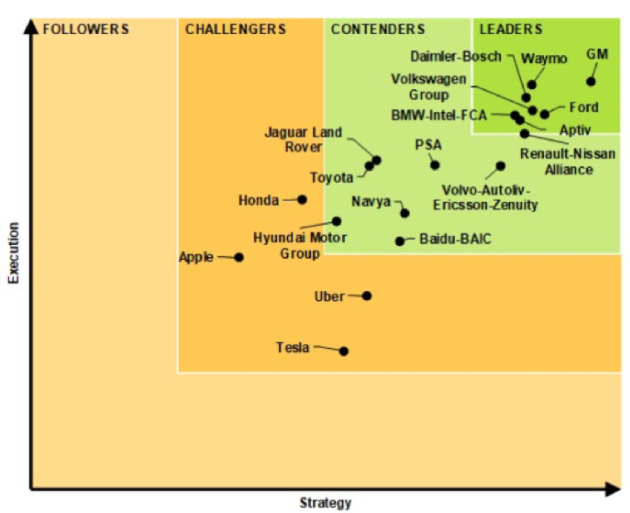 As Figure 2 shows, GM is already a recognized leader in the self-driving space. GM’s management recognizes that the auto industry is in the midst of a major transformation, and the company is taking the necessary steps to get out in front of that change rather than attempting to milk every dollar of profit out of its legacy and, in some cases, declining business. The market has responded positively to GM’s announcement, sending shares up ~7% on Monday, but there have been some prominent critics. Most notably, President Trump tweeted on Tuesday that he was looking at cutting GM’s subsidies for electric vehicles in response to the factory closings. GM shareholders should not be too worried about this threat, as the president would need congressional approval to remove these subsidies, which is unlikely to happen. More directly, the criticism that GM is facing for closing factories and cutting its workforce ignores economic realities. As we saw in ’08, keeping unproductive factories open during good economic times just means the cuts will be even more dramatic and painful when the next recession begins. By taking proactive measures, GM can limit the pain, free up resources, and invest in future growth opportunities that will create even more jobs over the long-term. Even after the positive market reaction to this announcement, GM remains cheap. At its current price of $36/share, GM has a price to economic book value ratio (PEBV) of just 0.6, which means the market expects the company’s net operating profit after tax (NOPAT) to permanently decline by 40%. We think this is an overly pessimistic expectation, especially considering the cost savings and future growth in self-driving cars and EV’s that this transformation should bring about. Even if GM’s NOPAT declines by 2% compounded annually for the next five years, the stock is worth $67/share today, an 82% upside from the current price. See the math behind this dynamic DCF scenario. The market still significantly undervalues the impact of GM’s excellent leadership and superior corporate governance. By focusing on ROIC, GM has put itself on a path to survive the transformation of the auto industry and come out the other side a more sustainable and profitable business.